Jeanna Maher: She was allegedly murdered. A man is to stand trial accused of murdering his wife with a mallet. 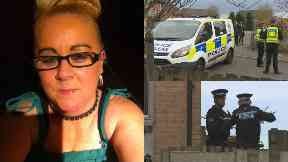 Peter Maher allegedly killed Jeanna Maher, 51, at her home in Drumchapel, Glasgow, on September 26. The 57-year-old pleaded not guilty at the High Court in Glasgow. Mrs Maher, an Asda supermarket worker, is said to have had her wrists and ankles bound with ligatures before being repeatedly struck with a mallet or similar item. Mr Jones and prosecutor Steven Borthwick both agreed a trial could now be set. Lord Matthews fixed a trial for September. The case could last up to 10 days. Maher is also charged with attempting to defeat the ends of justice after the alleged killing. This includes a claim he cleaned blood at the house and changed his clothes. He is further accused of assaulting his wife on various occasions between January 2012 until the day before the alleged killing. The charge states he punched her as well as threw a mobile phone and remote control at her.